I'm back home in Taipei for a few days, spending time with the parental units since I won't be with them this Christmas. But I also haven't seen some of my friends from Taipei for a while, so I decided to meet up with a few tonight just after we landed. The restaurant scene in Taipei has had a few relatively exciting "imports" over the last two years, and one of them is Family Li Imperial Cuisine (厲家菜), whose original restaurant in Beijing had been voted No. 46 on the 2014 list of Asia's 50 Best Restaurants. Not having been to the original, I figured I'd give the branch a try while I'm in Taipei. After all, it's been open for more than a year, and they should have been able to work out all the kinks by now. Only set menus are available here, with food delivered in single portions, and I decided to take the cheapest one available - interestingly named Lily of the Valley (鈴蘭). The more expensive options all have either shark's fin, abalone, or both. Since I don't eat shark's fin, and I wasn't about to ask my friends to splurge for a restaurant none of us have ever tried before, the cheapest option seemed the most rational choice. A few plates of candied walnuts greet us, surprisingly without any sesame seeds. Our meal begins with 10 different starters - a few of which are literally bite-sized. Shredded duck meat with cabbages (涼拌火鴨絲) - the shreds of smoked duck meat, though fine, were able to deliver enough flavor and fragrance. The shredded cabbage helped make this into a light and refreshing first bite. Mashed green soy beans with minced scallops (翡翠豆腐) - I thought this was kinda interesting in terms of flavor, and definitely tasted the seafood. Hello Kitty found the taste a little weird, and wondered if the scallops were fresh. Beijing smoked pork (北京燻肉) - a very thin slice of flavorful pork, served on top of a thin wafer of crispy fried dough. Deep fried spring roll (炸春捲) - the tiny spring roll was OK, but the thin sliver of yuzu (柚子) rind on top of the pickled radish made things a little more interesting. Vegetarian’s special (羅漢齋) - an interesting version with lotus root, lily bulb, walnut, black wood ear fungus, shiitake mushrooms, and tofu skin. Boiled chicken with spicy sauce (椒麻雞) - the local free-range chicken was pretty tender and tasty, even without the spicy chili sauce on top. Stewed pork rib in sweet and sour sauce (糖醋排骨) - the parts surrounding the bone were pretty tender thanks to the fat, but the lean meat was slightly on the dry and tough side. Deep fried beef with spicy sauce (麻辣牛肉) - interesting with that slightly spicy kick. Served with thin shreds of spring onion whites. Sour plum juice (酸梅湯) was served as a palate-cleanser before the hot dishes arrive. I loved the strong flavors here. Deep fried scallops (青松鮮貝) - curious to see scallops battered and fried, especially when the batter was a little soft - perhaps from sitting around a little too long. Cooked with a little Shaoxing wine (紹興酒). This was OK, but Hello Kitty thought that the scallops could have been a little more fresh. The leaves of Shanghainese cabbage (青江菜) were shredded then deep-fried. Braised sea cucumber with scallion oil sauce (蔥燒刺參) - FAIL. The sea cucumbers were completely tasteless, which meant they didn't bother braising them in any kind of sauce for a meaningful amount of time. The accompanying sauce had plenty of flavor, and plenty of collagen or something else that made our lips stick together... but whatever it was, it sure didn't come from the sea cucumber! Stir fried lobster with chicken stock (炸烹龍蝦) - while the lobster was pretty tasty, it would have been better without the light coat of batter. Deep fried fish with soya oil (焌油鮮魚) - the painted coral trout (紅石斑) was lightly battered and deep-fried. This was pretty good. One has a choice of noodles or rice, so Hello Kitty and I each took one so we could taste both. Stir fried eggplants with minced pork and shrimps, served with rice (小炒茄子配米飯) - this was very, very good. The eggplant and the minced pork and dried shrimp had plenty of flavor thanks to being well seasoned, and one could easily devour the accompanying bowl of steamed rice. Mom's version would probably still have a slight edge, but this was pretty close. Handmade noodle with minced pork and Chinese pickled vegetable (肉末榨菜配手工麵條) - Hello Kitty remarked that this tasted a little like the steamed pork patty with preserved leafy mustard (梅菜蒸肉餅) found in Cantonese cuisine, and I kinda have to agree. The noodles were a little mushy thanks to sitting around in the bowl of broth a little too long. The eggplant with rice is a far better choice. Steamed chicken soup with minced prawns (冬瓜蝦丸子湯) - nice and clear soup with balls of winter gourd, and little balls made with minced prawns. Fresh milk yogurt (奶酪) - supposedly made with Chinese baijiu (白酒), although I didn't taste any. Sweetened Chinese yam (蜜汁山藥) - not bad. Fried egg custard (三不沾) - the Chinese name literally translates as "three non-sticks", which is to stay that this blob of glutinous custard doesn't stick to one's teeth, nor the plate, nor the wok it was fried in. Not bad. 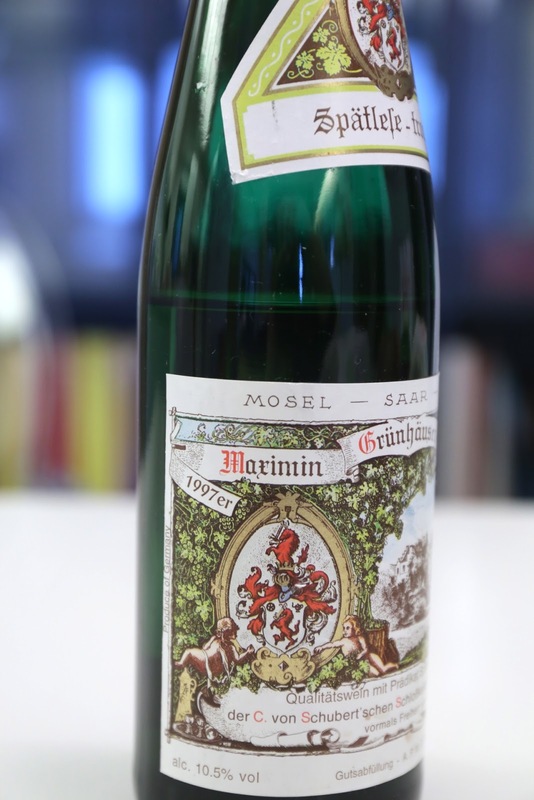 1997 Von Schubert Maximin Grünhauser Abstberg Riesling Spätlese-trocken - nose was a little pungent, with polyurethane notes. Palate definitely on the dry side. Hello Kitty noticed that the restaurant was falling short on detail, especially for a restaurant charging this kind of money. There were a couple of instances where we found holes in our veggies. While one can argue that this shows the veggies are "organic" since insects are eating them, I do agree that this kind of thing would never be allowed to happen at a high-end Chinese restaurant in Hong Kong. We discussed about the lack of customers and whether local Taiwanese would take to the restaurant. First of all, nobody I know has been here. Few had even heard of the place. While pricing isn't outrageous, it isn't exactly cheap, either... And for a lot of Chinese people - especially in Taiwan - the mindset is that they are happy to pay for premium ingredients, but are reluctant to pay for creativity, skill, and execution of the chef/kitchen. So... let's see whether this place will survive another year.